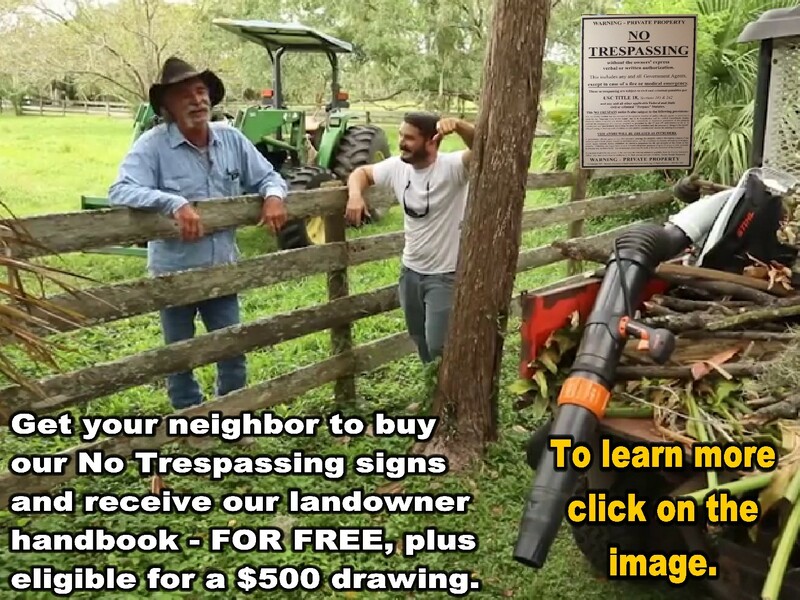 The NARLO Rural Landowner Handbook comes free with the purchase of our No Trespassing signs, HERE or HERE. If you are up against the city, the county, the state, or the federal government, the information contained in this handbook can help you walk through the issues and challenge and win against government errors, arrogance and abuse. Government will throw all kinds of law at you, but many times they are wrong. Right or wrong, you can challenge their law with the right kind of documents. Living on the land is hard, but in most cases, rewarding. That is until some government official comes calling with pen, paper and camera in hand gathering evidence, or the landowner receives a threatening notice from the government of some code violation. With the explosion of land use and environmental regulations all throughout America, the chances of receiving a visit by a government agent, or a threatening notice, grows literally by the day. 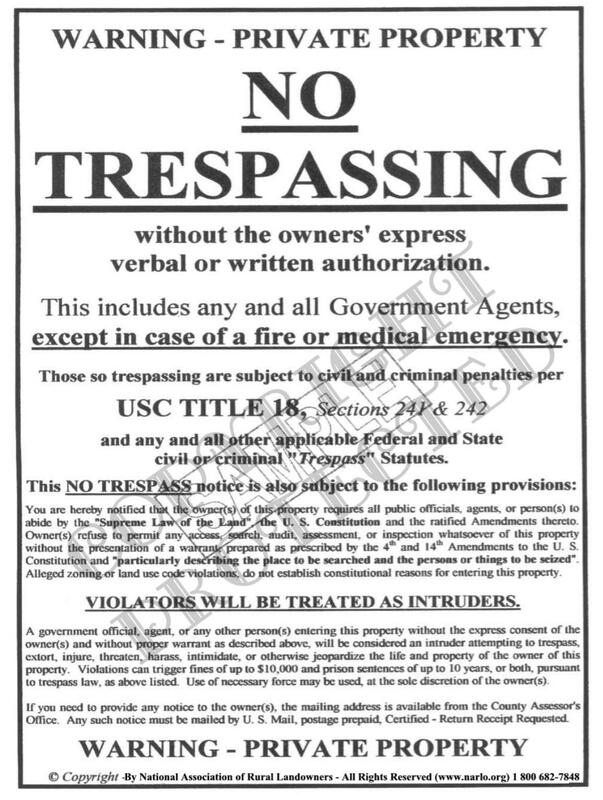 When so confronted in person by a local, state, or the federal government agent or some notice of a code violation, many landowners do one of two things: 1) try to fight the alleged violation or violations on their own, or 2) God forbid, they hire an attorney who promptly relieves them of their life's savings. The information contained in this one-of-a-kind, landowner handbook represents a compilation of over 30 years of experience in real estate and property rights by the author. The NARLO handbook not only contains information on how to challenge government without hiring a lawyer, but also provides a short real estate course covering the basics of real estate ownership that covers buying, selling, investing, managing income property and developing land. It is full of powerful resource material that is useful to almost every landowner in America. The Handbook comes on a universal USB Flash Drive that is compatible with almost every computer, MAC or PC, containing a USB port. Most of the files were created in the Microsoft WORD program that should be readable by any Microsoft WORD program after 2000. The material also contains a power point presentation, four videos, multiple real estate documents and spreadsheets. All of the files in the Handbook can be uploaded to your computer to its own directory and then the USB Flash Drive can be used for other purposes, like back-up files, data storage, or data transfers from computer to computer. Each section and chapter are jam packed with powerful and useful information for the urban or rural landowner and can be read and studied individually, without having to hold an entire book in your hand. The voluminous resource sections contain information for every landowner no matter in which state they reside. Section A contains most of the resource files. The Appendix Section contains useful examples of documents for real estate transactions, or inspecting or managing real estate. It can be a rewarding experience to research all of the many files that are contained in this one-of-a-kind, Landowner Handbook. No Foreign Country Orders PLEASE! To order your copy of NARLO's Landowner Handbook on a USB Flash Drive, use the "BUY NOW" button below, or click HERE to order by check or money order. All of the information contained in the "NARLO's Handbook" is proprietary to and the exclusive property of NARLO, (National Association of Rural Landowners) except that this copyrighted information may be used by a single user for their own personal use. However, in no event is all, or any portion of the information contained in said package, to be copied in any manner, nor distributed to any other party or entity in any manner whatsoever, without the express written permission of the purveyor of this website. Federal Law provides for severe civil and criminal penalties for the un-authorized reproduction, distribution or exhibition of copyrighted information in any medium. (Title 17, US Code, Sections 501 and 506). The Federal Bureau of Investigation investigates allegations of criminal copyright infringement. (Title 17, US Code, Section 504) Any detected copyright infringement will be prosecuted to the full extent of the law. © Copyright January 2019 by the National Association of Rural Landowners - All rights reserved.